How Fast Can the Economy Realistically Be Expected to Grow? Both President Trump and the Republican Congress want the economy to grow faster than the slow 2% growth which we have experienced since the Great Recession ended in June 2009. 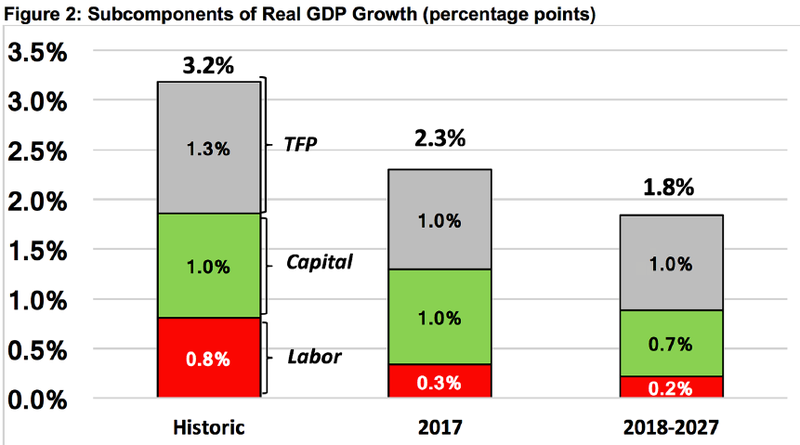 The Congressional Budget Office predicts (see chart below) that growth will average just 1.8% over the next ten years under current policy. Immigration reform, .3%, by increasing the number of workers. Tax reform, .18%, if well designed. However, deficit-financed tax reform would ultimately harm growth. Increase the Social Security retirement age by two years, .15%, by keeping people in the workforce longer. Reduce deficits by $4 trillion over ten years, .1%. This is enough deficit reduction to put our debt on a sustainable, downward path. Continue expanding energy production at the shale boom level, .09%. Repeal of the Affordable Care Act, .08%, will keep more people in the workforce. Ratifying the Trans Pacific Partnership, .01%, by increasing foreign trade. Increasing public investment in infrastructure, education and research by $40 billion per year, .1%. Note that all of these changes would increase growth by an estimated .83% of GDP per year. Added to the 1.8% base this yields a growth rate of 2.63%. Unfortunately, many of these reforms are unlikely to occur. On the other hand, various deregulatory actions being taken by the Trump administration are likely to increase growth by an unknown amount. Conclusion. It is reasonable to anticipate that growth can and will be speeded up to about 2.5% of GDP per year under the Trump administration. Along with the tight labor market now developing (current unemployment rate of 4.4%), blue-collar and other middle class workers should continue to receive decent pay increases for the foreseeable future. This entry was posted in Committee for a Responsible Federal Budget, Congressional Budget Office, deregulation, Donald Trump, economic growth, Jack Heidel, tax reform and tagged Committee for a Responsible Federal Budget, congressional budget office, debt, deficit, deregulation, Donald Trump, economic growth, jack heidel, tax reform by jackheidel. Bookmark the permalink. As I read and listen to the news about Trump’s budget, I struggle with your priorities of reducing the national debt. I have no problem with it being reduced. But I do have a problem with the reduction in expenses for the poor and hungry. Because they are the least powerful, it has always been so easy to sacrifice them. What is your balancing point in serving these groups and affording tax cuts for the wealthy, whether it be for bigger houses and salaries or for corporate growth? I am not calling for an utopia but only for some reduction in suffering; surely our economic policies ought not to increase their suffering and powerlessness. I am not in favor of tax cuts for the wealthy! I am in favor of revenue neutral tax rate cuts, paid for by shrinking deductions (for the wealthy, of course, who get by far the most deductions). Tax reform, done correctly in a revenue neutral way, will boost economic growth. As far as spending cuts to shrink deficits, they need to be widely shared by all. See my latest post for more details. Fair enough! I fear that the Trump administration won’t get out of the chute to do much of anything. You may be right, of course. Maybe Trump will be impeached but I doubt it. In the meantime I think Congress will make progress, however slowly, on important issues like healthcare reform, budget reform (i.e. moving towards a balanced budget) and tax reform. But then I’m an eternal optimist!